Cut your grooming time in half! The dual use Vac n'Blo Pro does all the work for you. Used as a vacuum, the super suction gets down deep to remove dirt, dandruff, loose hair, and parasites. Used as a blower, dry the coat evenly and completely, leaving hair soft and lustrous. The Vac n'Blo Pro is lightweight and portable with an adjustable shoulder strap- take it with you anywhere you travel with your horse. 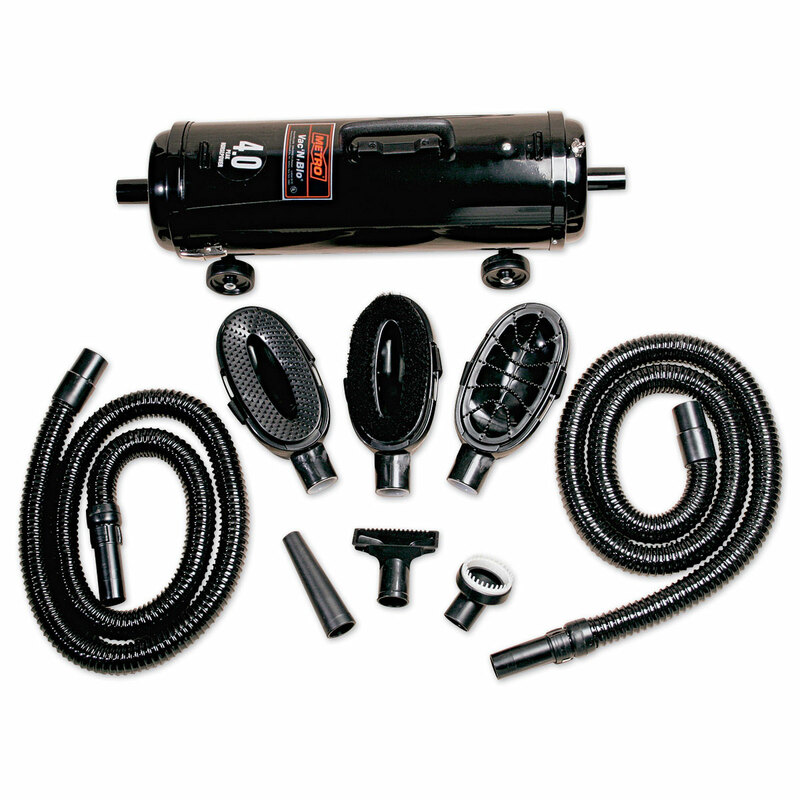 Built for continuous heavy duty operation, the Vac n'Blo Pro has a 4.0 PHP motor with 11.25 amps. Use with Vac n'Blo Disposable Bags and Vac n'Blo Fiberglass Filters! Sturdy steel baked enamel finish. A good bot-worm control program includes eliminating bot eggs from your horse. The Bot Egg Knife's special shape is designed to reach into crevices where bot eggs are found. 9" Long. Imported. Light as a whisper and soft as a cloud, this pretty micro-fiber draws away dust, leaving a brilliant shine. Perfect for face and sensitive areas. Vac n'Blo Pro is rated 4.2 out of 5 by 14. Rated 1 out of 5 by Michelle G from Doesn't work I received this as a Christmas gift and recently broke it out to give it a try. Unfortunately, the vacuum is simply not powerful enough to get the dirt off, and creates so much static that it freaks my horse out. Very disappointed as I usually love the quality of Smart Pak products. Rated 5 out of 5 by Wisdomhorse from No more inhaling dirt Great vacuum. Once the horses are used to the noise they seem to enjoy being vacuumed as much as a regular brushing. The bag fills up really fast, so buy some extra bags right away. The horses seem cleaner and are definately less dusty this winter. Rated 5 out of 5 by Mjblv from Love this vac! Bought this wondering if it would be as good as other horse vacuums. It is fantastic! To my surprise, it works as well as the larger horse vacs and is just as quiet. Very happy with the purchase. Rated 5 out of 5 by blancosmom from excellent suction!! I bought this to help keep the dust out of my very 'pig pen' Gray horse. he loves to lie down in his pen and the dirt is difficult to keep up with in the colorado winters. I don't have access to warm water, so I can only spot clean...and this vac has a 'blow' as well as 'vac' use to it. the attachments are great too! Rated 5 out of 5 by Valerie from Great Results I bought this product and I am amazed by the results. The pad I use under the saddle doesn't require the frequent washing as it did prior to the purchase. My horse has an unbelievable shiny coat. I can only recommend its purchase. Rated 4 out of 5 by Equiniphile from Great vacuum, but cheap parts I bought this a year ago for winter grooming before shows, but am a little disappointed with the lack of quality in the attachments. I had a hose and the triangle attachment break within a month of using them. I also don't know that the suction power is that great. It seems to me that the dust never comes all the way out. It worked great for a few months, but after that started to fade. I still find myself using the hot towel method before using the vacuum, as I just don't think it gets everything up. Rated 5 out of 5 by Smitty from Great Vacuum I have a grey horse and this cuts my grooming time down by hours. My boy loves to roll in the mud, it dries on him and all I have is a mass of dirt and dust. Now I don't have to breath it in or wear a mask when I clean him. The curry cleans him fast. Best investment, I would recommend it to anyone. Word to the wise - if you have a horse that is very dry you may get some static all you need to do is keep you hands on the curry and not directly touch him with that hand...works like a charm. Rated 4 out of 5 by Bobby from Super Suction power Very versatille vacuum with many different brush attachments. Fits well in a smaller tool box. The suction power and blower have amazing power. Great bang for your buck! Rated 2 out of 5 by carriagedriver from works but very loud I find that this vac n'Blo works ok but both you and horse need ear plugs.